Automatic electronic entrance doors and there are no steps. Disabled parking bays immediately outside main entrance. 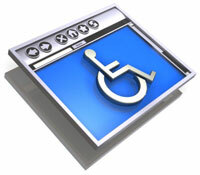 There is a wheelchair available for patient use. There is a disabled toilet. We have hydraulic couches in the treatment room to provide comfortable examination facilities for the elderly or disabled. Wheeled chair for safe removal of disabled patients in event of a fire. Where possible Motorised Scooter users are requested to leave these parked outside the surgery - there is a bicycle rack to which they can be chained for security. Under no circumstances must they be left unattended inside the surgery entrance where they restrict access to the main doors which also function as an emergency exit which must be kept clear at all times.